Diatoms are thought to provide about 40% of total global photosynthesis and diatoms of the genus Coscinodiscus are an important, sometimes dominant, cosmopolitan component of the marine diatom community. The oomycete parasitoid Lagenisma coscinodisci is widespread in the northern hemisphere on its hosts in the genus Coscinodiscus. Because of its potential ecological importance, it would be a suitable pathogen model to investigate plankton/parasite interactions, but the species cannot be cultivated on media without its host, so far. Thus, it was the aim of this study to explore the potential of dual culture of host and pathogen in the laboratory and to optimise cultivation to ensure a long-term cultivation of the pathogen. Here, we report successful cultivation of a single spore strain of L. coscinodisci (Isla), on several Coscinodiscus species and strains, as well as the establishment of a cultivation routine with Coscinodiscus granii (CGS1 and CG36), which enabled us to maintain the single spore strain for more than 3 years in 6 cm Petri dishes and 10 ml tissue culture flasks. This opens up the opportunity to study the processes and mechanism in plankton/parasitoid interactions under controlled conditions. 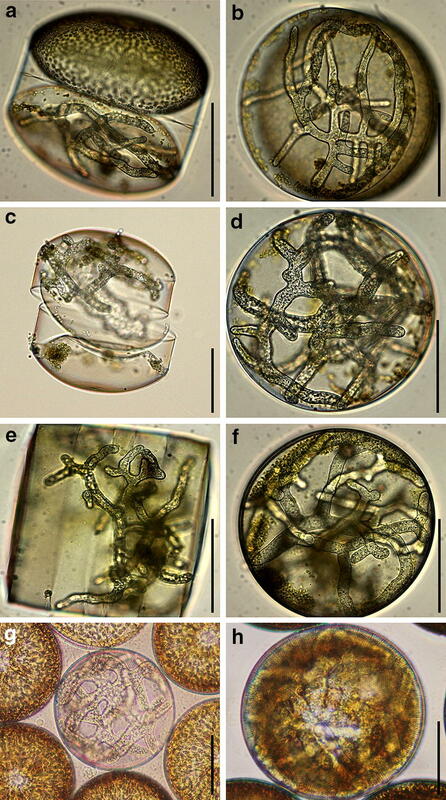 Oomycetes are fungal-like eukaryotes belonging to the Kingdom Straminipila, which also includes diatoms and brown seaweeds . 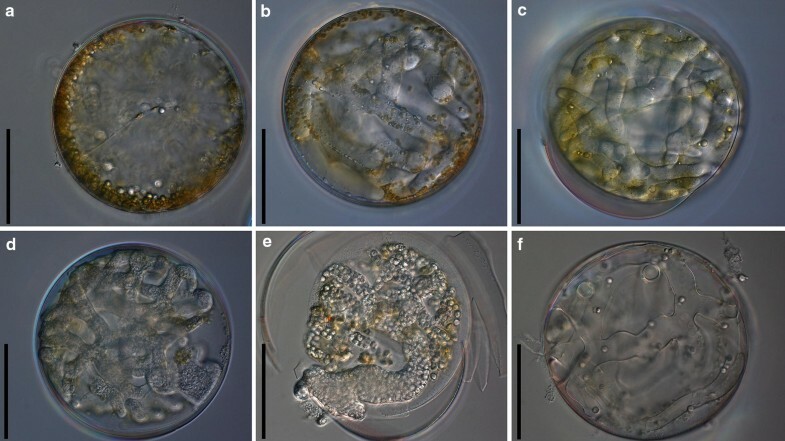 Oomycetes are present worldwide in terrestrial and marine ecosystems, where they act as saprotrophs and parasites of various eukaryotic groups [1, 2, 3]. Most of the more than 1000 known oomycete species are obligate parasites of flowering plants [2, 4], but many are also known as facultative animal pathogens [5, 6, 7] or saprotrophs in the limnic or marine environment [8, 9, 10, 11]. More than 90% of the known oomycete species are in two orders, the Peronosporales in the sense of Hulvey et al. and the Saprolegniales . While these groups are characterised by the formation of sporangia that are delimited from the vegetative thallus, there are many species mostly in early-diverging oomycete lineages, which have holocarpic thalli. This means that the entire thallus is converted into a sporangium upon maturity [12, 13, 14, 15, 16, 17, 18]. Many of these species are parasitoids, and kill their hosts during colonisation [19, 20, 21, 22, 23]. Lagenisma coscinodisci is one of these parasitoids [15, 20, 24] and is characterised by forming a branched thallus with stout hyphae in hosts of the large centric diatom genus Coscinodiscus. These hyphae later develop into sporangia in which hundreds to thousands of zoospores form to infect new hosts cells after release. The life cycle of the pathogen has been investigated in detail using transmission electron microscopy [25, 26, 27, 28, 29] and there is evidence for sexual reproduction by zoomeiospores instead of gametangia [25, 26]. Lagenisma coscinodisci has been established in dual cultures previously [24, 30] but these cultures are no longer available. 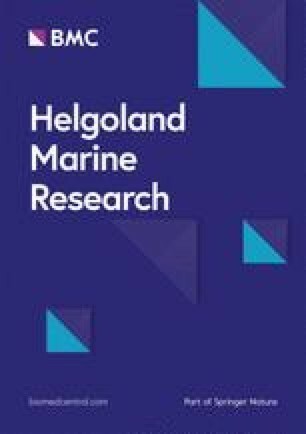 As the interaction between Coscinodiscus diatoms and their parasite L. coscinodisci might provide a suitable system to investigate plankton/parasite interaction, this study aimed at establishing a dual culture of Lagenisma and its hosts, as well as to optimise this culture towards a standardised model system. Diatom samples were collected at Helgoland Roads  using plankton nets with 20 µm mesh sizes in August 2016 and screened for the presence of Lagenisma as described previously . The parasite was found in both Coscinodiscus granii and C. wailesii. For establishing diatom cultures, single diatom cells were picked from the plankton sample, transferred three times through autoclaved seawater, and subsequently placed in small culture flasks (Sarstedt, Hamburg, Germany) filled with 10 ml of sterile seawater supplemented with nutrients and trace minerals to obtain a seawater f/2 medium . Flasks were incubated horizontally at 14 °C with a diurnal rhythm of 14 h light and 10 h darkness. While single cell isolates of the host diatoms were established, L. coscinodisci was maintained on mixed diatom samples, cultivated like the single diatom species cultures, but in 9 cm Petri dishes (Sarstedt). After 3–5 days, single diatoms were taken from the individual diatom cultures and transferred three times through sterile seawater using a 100 µl pipette (Brand, Wertheim, Germany) and 200 µl pipette tips (Sarstedt, Hamburg, Germany). This process was repeated until no other organisms apart from the potential diatom hosts could be observed. This way, pure cultures of C. concinnus, C. granii, C. radiatus, and C. wailesii were obtained. Subsequently, single diatoms from the corresponding species with a single thallus (i.e. derived from the infection by a single zoospore) of L. coscinodisci were picked from the mixed diatom sample, transferred three times through sterile seawater using a micropipette, and added to the corresponding single diatom host lines that had been allowed to multiply to at least 50 cells before infection. After pathogen thalli became apparent, diatoms with a single thallus were again transferred to an uninfected batch of the host. Subsequently, the transfer of infected cells to a new host was done every 7–14 days, and the cultivation was shifted to 6 cm Petri dishes (Sarstedt) instead of the cultivation flasks due to an easier handling and the lower costs associated with Petri dishes. After repeated cycles of infection for about 3 months the diatom/pathogen combination with the most steady infection rate was chosen for long-term cultivation as described above. Microscopy was performed as described previously  using an inverted microscope (AE30, Motic, Hong-Kong, China) for regular checks and subcultivation and a Zeiss Imager2 (Carl Zeiss, Jena, Germany) for microscopic images. For continuous supply of the host, CGS1 and CG36 were grown in 6 cm Petri dishes, and about 10 cells were transferred to new Petri dishes with marine f/2 medium every 2 weeks to maintain the diatom cultures. After 1 week of growth, 1–5 infected cells were added in triplicates to non-infected hosts, and triplicates of the hosts were maintained uninfected, in parallel. As the infection success of Isla in the two diatom lineages used is very high, only very few cases occurred, in which a single Petri dish with hosts did not get infected, which in those cases were likely due to an injury of the pathogen thallus during transfer. While it seemed that duplicates with a transfer of 2–3 thalli would be sufficient to ensure a continuous culture, we continued working with triplicates, keeping old cultures until first signs of infection were seen in new ones, to account for unforeseen events. Cultures of C. granii host strains (CGS1, CG36), and the L. coscinodisci strain Isla (Ist strain of Lagenisma) were deposited in the culture collection of the Thines laboratory and are available upon request to interested researchers. Unfortunately, no culture collection contacted felt able to host the dual culture. Requests from culture collections are, thus, particularly welcome. Initially, 16 cell lines of four isolated Coscinodiscus species were established; Strain CC1, CC2, CC3 for C. concinnus, CGS1, CG36, CG1, CG2, CG3, CG4, CG5 for C. granii, CR1, CR2, CR3 for C. radiatus, and CW1, CW2, CW3 for C. wailesii. All four diatom species could be infected by L. coscinodisci (Fig. 1), but infections were most reliably achieved in C. granii, which was therefore used as the sole host for further optimisation of the cultivation. Strains of the other diatom species were only kept to explore the effect of long-term cultivation. After about 1 year of cultivation, C. wailesii cultures had developed into cell sizes often less than 50 µm and frustules became abnormally shaped and increasingly fragile. One of the cultures reverted back into normal-sized diatoms after auxospore formation, but the resulting strain was resistant to the strain that could previously infect this diatom species, but was kept on C. granii, when the C. wailesii cultures lost viability. Similarly, C. radiatus cultures declined after about one and a half years of continuous cultivation, and also C. concinnus could not be cultured long term. However, C. granii cultures remained stable over more than 2 years. After that period of time, they also grew to sizes below 50 µm, but several strains reverted into normally sized cells after auxospore formation. One strain of L. coscinodisci that very reliably infected C. granii strains, named Isla, has (by the submission of this manuscript) been cultivated continuously for more than 3 years. Its lifecycle is shown in Fig. 2. Isla is infective to C. concinnus, C. granii, and C. radiatus. Its speed of infection varied in different strains of C. granii. 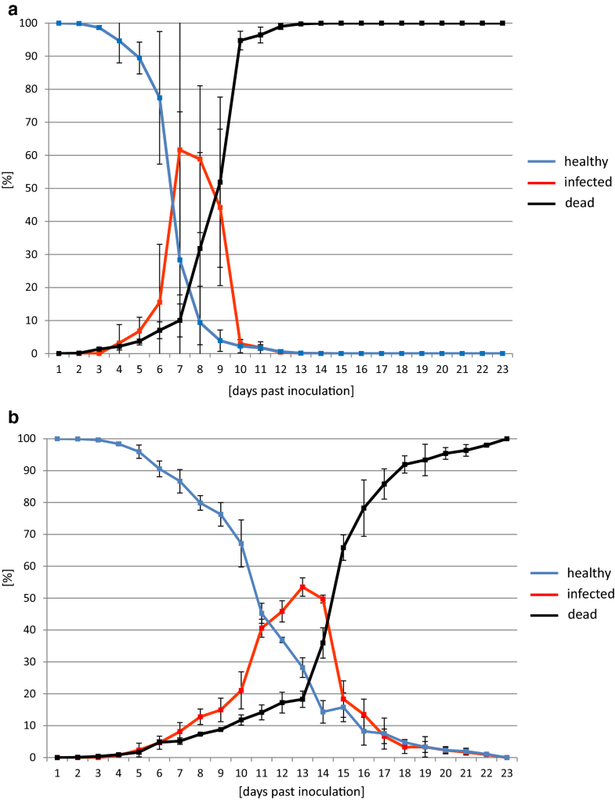 While in CGS1, the strain led to an infection peak at 6–7 days, with the majority of the diatoms infected, the peak of the infection was between 13 and 14 days in CG36 (Fig. 3). Because continued culture in CS36 thus necessitates transfer to a new host only every 2 weeks, it was chosen as the primary host for continued cultivation of Isla. Diatoms account for about 40% of the global photosynthesis, most of which takes place in the open sea where centric diatoms often dominate. However, similar to the blooms of the well-studied coccolithophorid Emiliania huxleyi , blooms often end abruptly. Members of the chytridiomycetes and oomycetes have been identified as important parasitoids of diatoms [34, 35, 36] and have been suggested as candidates for regulating diatom blooms that have previously been overlooked [37, 38]. Thus, it seems useful to establish laboratory model systems for investigating the interaction between diatoms and parasitoids for gaining insights into the processes and mechanisms in the infection process. Previously, apart from the Lagenisma/Coscinodiscus co-culture  dual culture of Coscinodiscus spp. and the nanoflagellate Pirsonia diadema had been achieved and proven useful for some basic insights into the interaction of diatoms and parasitoids, in particular host range  and the influence of abiotic factors on the outcome of infections . However, the system had not been fully standardised and was discontinued. Similarly, the pathosystem of Asterionella and Rhizophydium planktonicum, was successfully cultivated over a longer period of time and has yielded insights into its host range  and the effect of abiotic factors on the infection process [42, 43]. However, also in this case, the culture was discontinued after some time. Therefore, a Lagenisma/Coscinodiscus pathosystem was re-established and optimised in this study. The strain Isla, which can be obtained from the authors upon request, has been found to be particularly suited for this, as it remained stable in co-cultures with C. granii for 3 years. The virulence of Isla varied in different diatom strains. While it reached the highest infection rate in CGS1 already after about a week, this took twice as long in CG36, suggesting the presence of quantitative resistance. In the present study, it could not be demonstrated that qualitative resistance to Lagenisma also existed in C. granii. But, as it was observed that susceptible lineages of C. wailesii became resistant after regeneration through auxospore formation, qualitative resistance might not be rare. Even though it is unclear, what the basis for resistance might be, it seems plausible that a gene-for gene interaction, similar to the situation in flowering plants, is responsible for this phenomenon. Apoptosis upon recognition in unicellular organisms prevents the spread of the pathogen. However, also the host individual with the particular genotype leading to apoptosis will die. But other, non-resistant individuals potentially profit from the sacrifice . Thus, the Lagenisma/Coscinodiscus pathosystem might be an interesting one to elucidate mechanisms and evolutionary trajectories in the resistance development in unicellular organisms, as well as to study group selection of traits that are potentially fatal for individuals. MT conceived the study, AB and MT carried out initial cultivation experiments, AB carried out all optimisation and long-term cultivation experiments, AB and MT analysed the data, MT wrote the manuscript, with contributions from AB and AK. All authors read and approved the final manuscript. The authors are deeply grateful to Dr. Drebes and Dr. Schnepf, for their pioneering work on Lagenisma, which prompted the current study. We also thank Silvia Peters for support during the lab work on Helgoland and the guest scientist team for their advice and help with logistics. All data generated or analyzed during this study are included in this published article. The Coscinodiscus granii (CG36, CGS1) cell lines and the pathogen strain Isla used in this study are available from the corresponding author upon request. Funding by KAAD for a PhD fellowship to AB and by the LOEWE initiative of the government of Hessen, in the framework of the Centre of Translational Biodiversity Genomics (TBG) for MT is gratefully acknowledged.